On September 15th, we will be in attendance at Royal Star Arcade, in Maidstone with Moon. A new venue for the Grinning Demon’s charity event that attracts both the indy and the professional. Confirmed guests so far are Lloyd and the Bear’s Gibson Grey, Moon print designer Grant Perkins, Tinpot Hobo and Teenage Mutant Ninja Turtle artist Jack Lawrence, Grainne McEntee and Matt Rooke with Apes n’ Capes and Bertie Bear’s Andy Clift. We also know that Cy Dethan and Nic Wilkinson (Cancertown, Reverend: Wrath of God) and Dan Abnett (Guardians of the Galaxy, Legion of Superheroes, the Hypernaturals) are confirmed and friend to the Bunker and DJ to the stars Keiron Gillen (Uncanny X-men, Iron Man) may be in attendance. 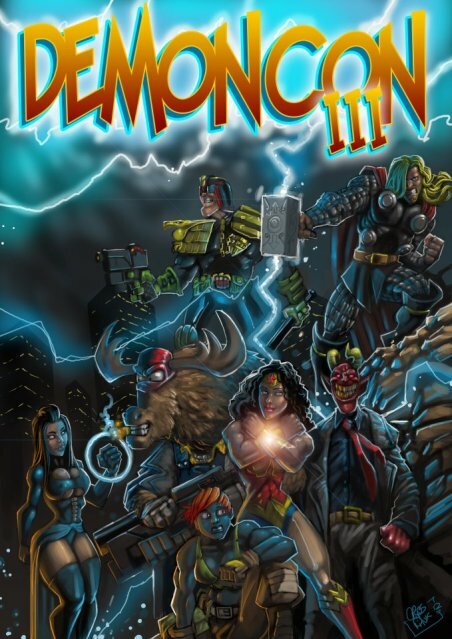 After 5 Demoncons and 5 very distinct posters, Graham Beadle, Demoncon organiser and owner of Grinning Demon comic shop came to the Beyond the Bunker table and was nice enough to ask me to design the new poster for Demoncon VI. Because of the nature of the convention as a charity event, the posters themselves are more lively and varied than anywhere else. 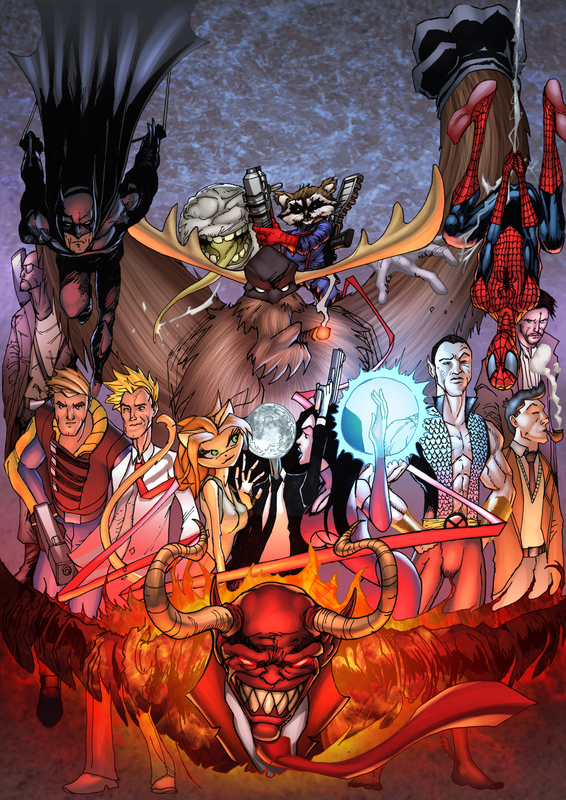 Right from the beginning, Demoncon posters have mashed up mainstream and indy in a visual bash up. Dredd stands beside Frostica, Wonderwoman by the Moose. That lack of limitation is irresistable for an upstart comic book artist like me so I was honoured to be asked frankly. The end mix as you see above. But i couldn’t do it on my own so I was aided by the incredible talent of Timaree Zadel (who also coloured the new prints that were available at MCM). With Ivanna Matilla currently waylaid by teaching English in 20 different schools, Timaree was her chosen colourist. As you can see, no reason not to be over the Moon with this work.